If you have painful flat feet, you are not alone famous celebrities like: Kelly Osbourne, Gbenga Akinnagbe, Kim K. and many famous NFL, NBA athletes have flat feet. In the age of minimalist shoes and shoe makers such as vibrim, et al now concentrating on looks vs function, we are seeing a good amount of posterior tibial tendon injuries from mild to severe. The posterior tibial tendon is a very important tendon that is the major supinator (holds up the arch) of the foot about the ankle. 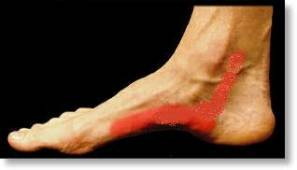 When this tendon is injured inflammation starts, chronic inflammation can lead to tears and flattening of the arch. There is a zone of hypovascularity behind the big ankle bone called the medial malleolus, this is where most tears are located. For some reason theres is the area of less bloodflow to the tendon. Other areas of tearing and inflammation is where this tendon inserts into the navicular bone or to an accessory (extra) navicular bone called the os tibialis externum. 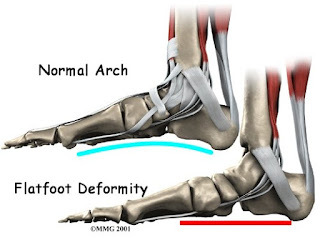 Chronic inflammation and tears can lead to a progressive flattening of the arch. Hence one of our most common complaint is:" Doc my arch is falling and my ankle hurts." Another complaint is the inability or difficulty in walking up the stairs. Ideally, we would like to see patients before the arch starts falling, once that process has started the tendon is already compromised. The area of red above shows the typical area of pain described by our patients upon presentation. Palpation or touching of this area will reproduce pain. If you look from behind you will see the outward deflection of the heel along with "too many toes" sign when viewing the foot from behind. In extreme cases patients can be have numbness in the foot from compression on the nerve that travels behind this tendon. There is a tarsal tunnel where this important nerve runs in the medial ankle. When the arch collapses the nerve is put under considerable stretch and pressure causing numbness / tingling. A nerve conduction study can help to identify / quantify this phenomenon. Gold standard for moderate to severe cases is the Ankle Foot Orthosis (AFO) which limited the ankle's pronation or flattening of the arch. AFO such as a Richie, Arizona, Colorado, Stepwell, etc type braces. Lateral column lengthening such as an Evan's calcaneal osteotomy where we place a bone wedge on the outside to bring the foot back under the ankle. 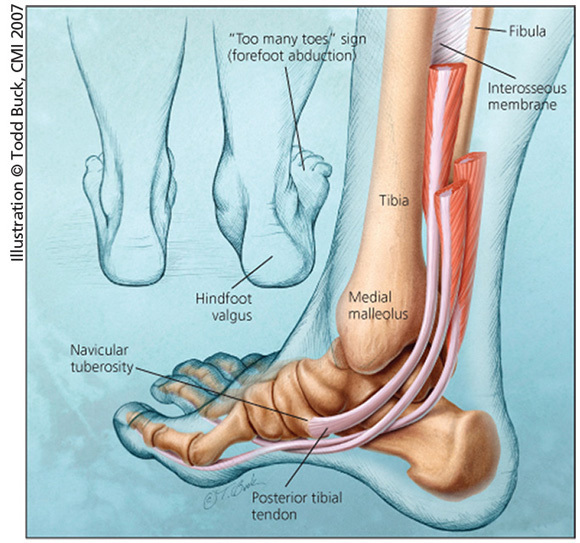 This is the only procedure that can correct in all three planes of the foot. This is a very powerful procedure for adult acquired flat foot where the toes all point outwards in the typical "too many toes sign," when seen from behind. NERD ALERT! The Evan's is the only flat foot procedure that can correct in all 3 planes (views) hence it is a very powerful / useful procedure. 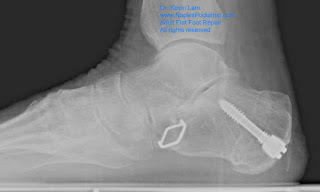 Preoperative eval for an Evan's Calcaneal Osteotomy. 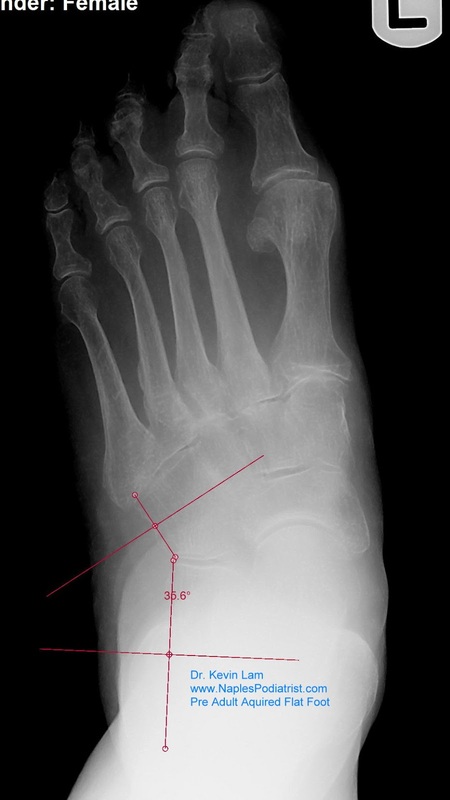 Notice the red line forming the angle the foot is collapsed with increased Calcanceal Cuboid joint angle. Greater than 5 degrees is abnormal on this view. Post operative view 7 months later shows the proper alignment and a more normal looking foot. Notice the darkened wedge in the heel bone. Problem solved at FFLC. 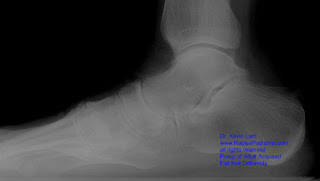 Medial calcaneal osteotomy where the heel bone is cut and shifted medially (inside) to realign the heel under the ankle joint. This comes in handy when there is a deformity of the heel bone itself or when the Evan's calcaneal osteotomy was not sufficient to correct the deformity. 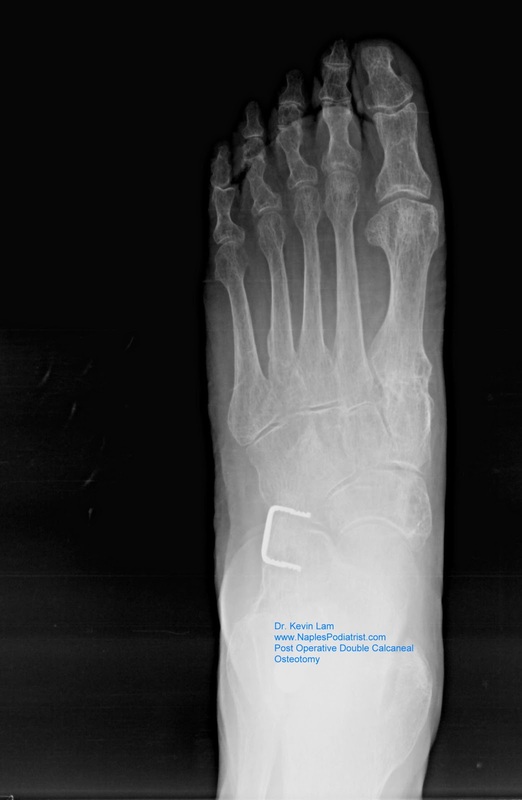 Below shows a case of double calcaneal (Evan's and the medial calcaneal slide) osteotomy used to fix an adult acquired flat foot deformity. After notes how the foot is now straight. Post op lateral view showing both osteotomies stabilized and the hindfoot well aligned. 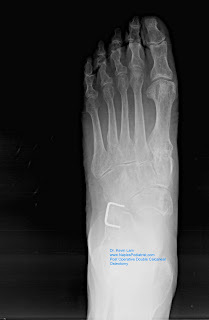 Subtalar joint implants or arthroeresis procedure is when an implant is placed into a hindfoot joint to stop the pronation or flattening of the arch. This procedure is a quick fix for some patients with mild to moderate disease but it is not covered by insurances and is deemed experimental even though it has been around for decades. Some surgeons use this as their primary procedure, I would disagree with that mentality. Trivia: First subtalar joint implants were made out of penile implants, cut and shaved to fit in the subtalar joint. Currently, they are made of stainless steel or titanium. 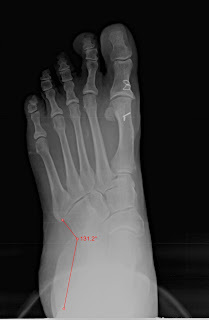 Below, shows before and after xrays of a painful pediatric flat foot that was corrected with a subtalar joint implant. Notice the metal circle holding up the arch of the foot. 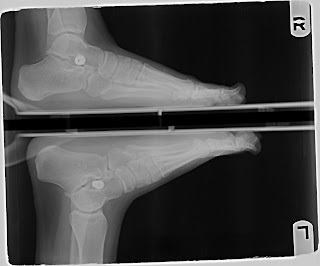 This was done in a 16 year old patient with painful flat feet and did not resolve with orthotics therapy. 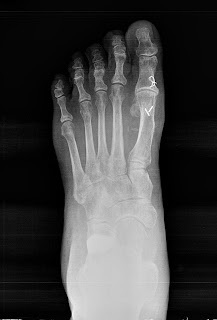 Some doctors will do this procedure for every patient with flat feet, but my personal preference is to do this only for certain patients that can not undergo a true reconstructive boney procedure or those that only want a quick fix with realization that they may require a more detailed procedure later when skeletally mature. Triple /double arthrodesis where we fuse 2 to 3 major hindfoot joints to create stability. Recent studies found this procedure to have the most satisfaction rating amongst patients. I would agree with this when used for Grade III or IV deformities, or if the patient is obese. Below you will notice the before photo of the ankle with the arch collapsed. The bottom shows the proper alignment of the joints with the arch restored. More often then not, an achilles tendon lengthening would be required as an adjunct to this procedure. 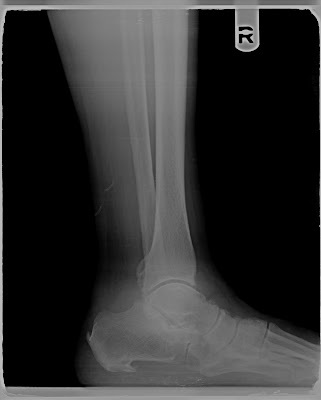 Case #1 : Preoperative Double Arthrodesis with collapsed foot. 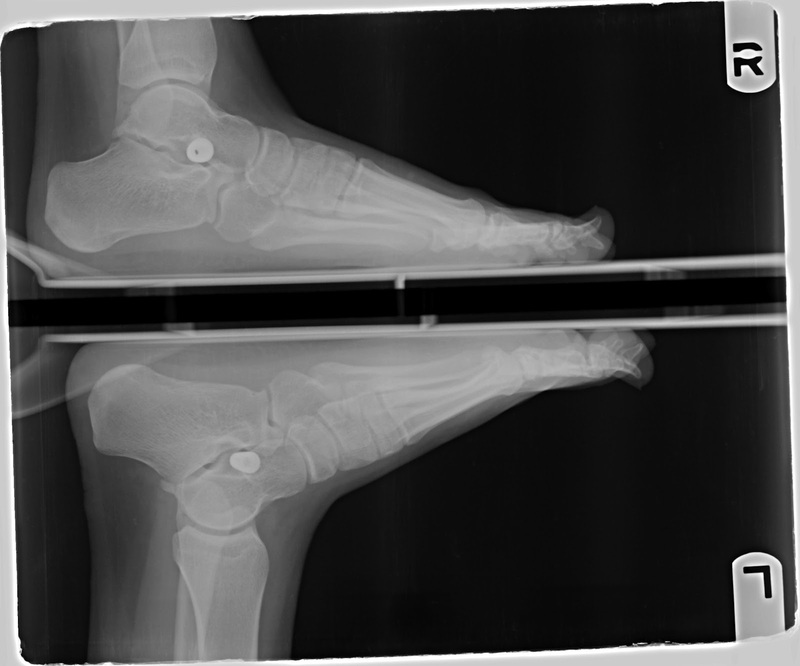 Case #2: Post operative Triple Arthrodesis 3 years later without pain in the ankle or foot. Tendon transfers may also be done. There is a tendon behind the posterior tibial tendon, flexor digitorum longus) that can be easily transferred forward, or used to replace the entire posterior tibial tendon. Usually the tendon used is the flexor digitorum longus which is right behind the posterior tibial tendon. The choice of surgical intervention can be a combination of those above. Your surgeon should have preferences from their past experiences. Beware of surgeons who only do this or only that procedure for PTTD. Different stages of the deformity requires different procedures and your surgeon should have experience with treating various stages and treatment protocols for each. Avoid heavy workout in minimalist shoes. 239 430 3668 option 2 for schedling. Thank you viewers for making this my most popular blog, I will continue to update and refine!